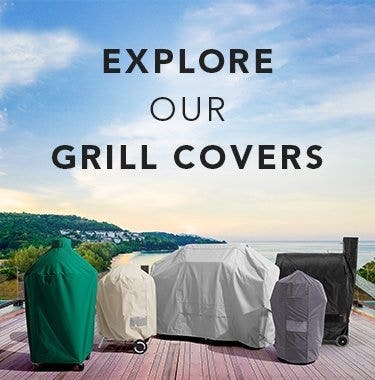 The most water-resistant and UV-resistant covers on the market, our Ultima collection of Outdoor Chair Covers are lightweight and flexible, but won't compromise easily under harsh weather elements.  Made from durable 300 denier solution-dyed polyester fabric,meaning the yarns are dyed prior to weaving to achieve optimal colorfastness overtime. Ultima chair covers comes with a plethora of smart features like a 360 degree elastic hem with drawcord locking system, as well as four buckle straps in opposing corners to provide a snug fit and look. 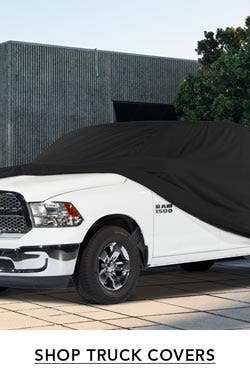 A discreet mesh vent and flap have also been incorporated to help facilitate airflow needed to block mold & mildew and ensure maximum breathability. All Covermates Ultima chair covers come backed by our seven-year best-in-class warranty so you can purchase with confidence. Have not used them yet; but they appear to be excellent quality. They fit perfectly on our chairs; which are the tall non-stackable chairs. I love my covers, bought 4, the durability is great. Definitely satisfied with this product. Got here on time, good material, covers fit perfectly. Just received our new set of bistro/bar chair covers to replace the set that we've had for6 years. Exactly what we needed! 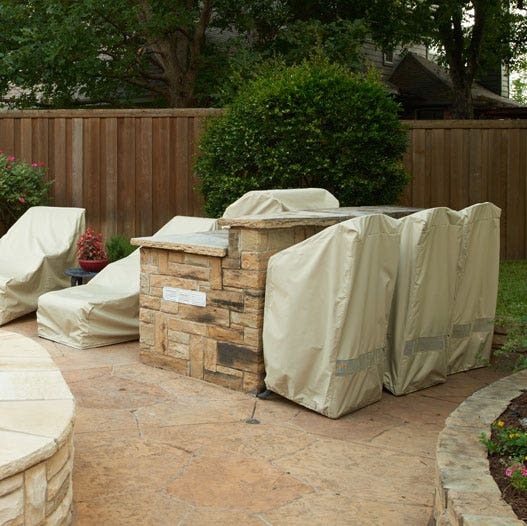 Our deck receives a lot of direct sun and weather, so these covers have kept us from having to replace our deck furniture, which saves so much money in the long run! Plus, when your ready to enjoy some "deck time", all you have to do is take off the covers! No rinsing off the furniture since the covers keep them clean and dry. Service was great. The chair covers fit perfectly and are of very good quality. Several methods of securing cover to the chair. I ordered these covers based on the measurements. They are covering Cracker Barrel rocking chairs, even though they aren’t a “custom” fit. They cover the entire chairs including the rockers we couldn’t be happier! 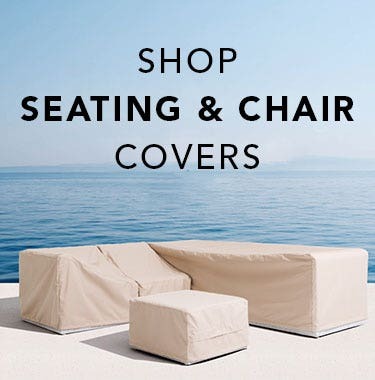 I have purchased Coverstore covers for lounge chairs, sling chairs, benches, tables and stacking chairs. All the covers in all the various sizes have been well made and have withstood harsh weather. 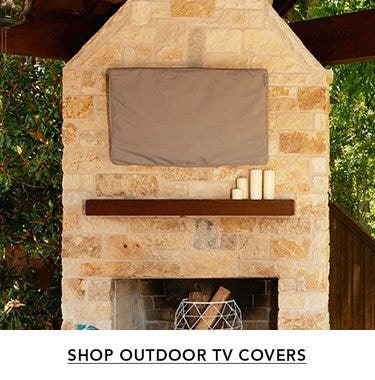 I highly recommend Coverstore covers. 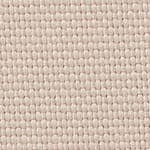 There is a slight shade difference between the tan and khaki, but the two colors blend nicely. The covers are quite attractive. i have purchased many covers from the cover store. i cover everything!! i love the quality of these covers. they are the best!! These are very good quality covers. The order came when promised. perfect and will use coverstore again. shipped and arrived on time .excellent material and construction. Excellent, covers fit and the snaps on bottom of covers keep them on the chairs. 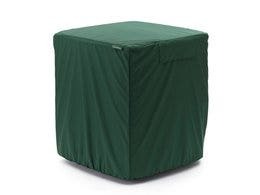 The bar chair covers are just a couple of products we ordered over the last couple of years. we have found them a very good product. I was very happy to get these chair covers as they also fit over our high back swivel chairs as well. 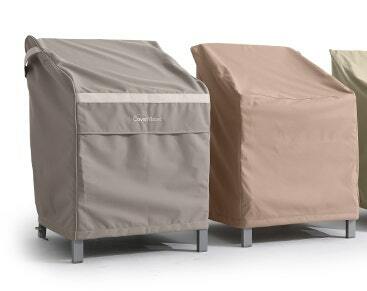 We also have a BBQ cover which is still like new after three winters. 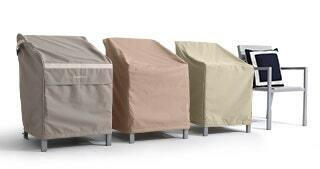 I have now purchased the Elite covers for our bar chairs, heater tables, lounge chairs, umbrella cover and sectional sofa for outside. The quality and look of these covers are fantastic!!!! very easy to use website. a great product years ago and now! This size fit "Zero Gravity" chair, partially folded, perfectly. 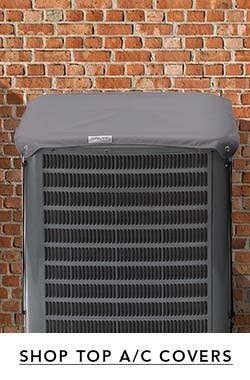 "Classic" fabric covers are durable, well constructed, ventilate nicely, protect beautifully for years and years. Great customer service, I had to call to get the code to receive free shipping since this was my first time purchase, they were awesome and responsive. A few days later we received our covers. Package nicely and exactly what we ordered. Product is nice and durable! Totally a happy customer! Very satisfied with chair covers that I plan to order one for the table as soon as I get a chance to measure it - if it ever stops raining! This is of the highest quality, the rain just rolls off. 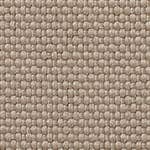 Very durable material. I had ordered the the table and chari covers 2 years ago and was so pleased witht eh product I ordered thsi for my bar. I just put them on my chairs so it is way too soon to tell how they will be throughout their 1st winter ! !Product seemed to be ok ...will let you know how they held up during their 1st northeastern winter !! My patio chair covers fit perfect. Shipping time was excellent. I'm glad I found you on the web. We loved the chair covers that we purchased recently!! They are so well made and exactly what was described on the website! Thanks for the great product and service. 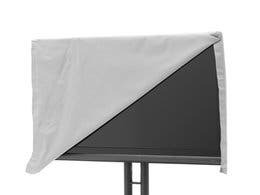 easy to install over chairs, the fitted, elastic bottom secures cover so winds, snow and moisture are prevented from damaging the chairs. 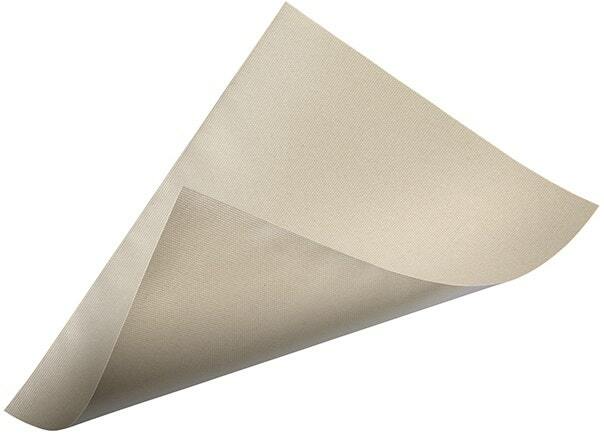 Great delivery service and quality of cover fabric matches/exceeds description on website. Great quality and impressive price. 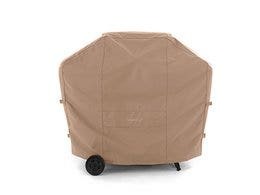 Will order another cover for the fire pit! Arrived quickly, well packed, nice materials and appears to be well made. Now we just have to see how it handles the weather... but so far, very impressive. received in good time in good condition. Just what I wanted. Item as described, high quality. Water beads up and runs off my new covers. Fits my high porch chairs as if they were custom made. Bought two chair covers to replace ones purchased from The Cover Store a few years ago. Quality is excellent and order arrived in timely fashion. The quality of this product is excellent. I received it promptly even though I selected the least expensive mailing choice. My wife and I have been extremely impressed with the quality and workmanship of the products we've received from the Cover Store. We have ordered many products over the past several years and plan on ordering many more in the future. It's nice to receive a quality product. 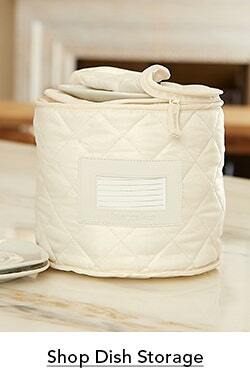 We have recommended the Cover Store products to family and friends who have had the need to cover various items. We don't typically submit reviews but this company is worth the time to express our appreciation for what they offer. The covers are an amazing fit. They are easy on and off. This was my third set of covers this season as I and my two sons all got new patio furniture, and we were all in need of covers. Quick delivery, nice packaging, you really can't go wrong with the Cover Store. Very pleased with the quality and quick delivery. Ordering on line was quick and easy. Thank you! Great quality and fits our bar stools perfectly! I have owned chair covers for my deck at the beach. I just purchased two rocking chairs for my home in Pa where we get a good amount of snow each year. Looking forward to the same quality and durability that I have had before. Great product!